Double click on the downloaded file mp4tomp3.exe to start installation, which is fast and requires no knowledge. After installation, run it you will see the user interface below. You can click on Add Button or Add Folder Button to add a single MP4/Media file, or several MP4/Media files from a folder to the conversion list. At the right bottom field you can see an Output Path option. Click on Browse button to set an output path, which will be the destination folder of converted MP3 files. 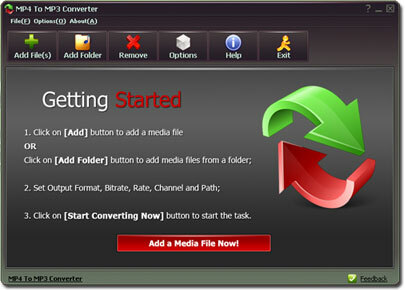 Click on the biggest Start Converting Now button, the conversion task will be started immediately.